Overseas sourcing and pricing of heavy-duty forged parts with domestic assurance of engineering, quality and delivery. The pressure is on every day for you to decrease costs and simplify your supplier sources. An obvious solution is to shop overseas for a lower price, but importing heavy-duty parts direct is not always easy or more reliable. 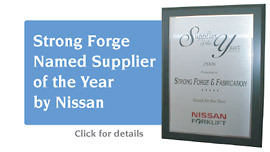 Get the best of the entire world from StrongSource. We bring more than 75 years of metalworking expertise to the marketplace, sourcing parts worldwide to meet your pricing goals without sacrificing quality or delivery schedules. Provide engineering services and prototypes of your parts from tooling produced in our facility. For medium and large quantities, engage a supplier from our offshore network that meets your quality standards and production schedule at a favorable price. Assure on-time delivery by our capability to produce your part in our own full-service facility to satisfy “in-between” orders or emergency needs. Your ordering process is simplified – no headaches and hassles of dealing with the complexity of importing direct. The responsibility for quality and delivery is in our capable hands; the benefits of price and a successful project are yours.